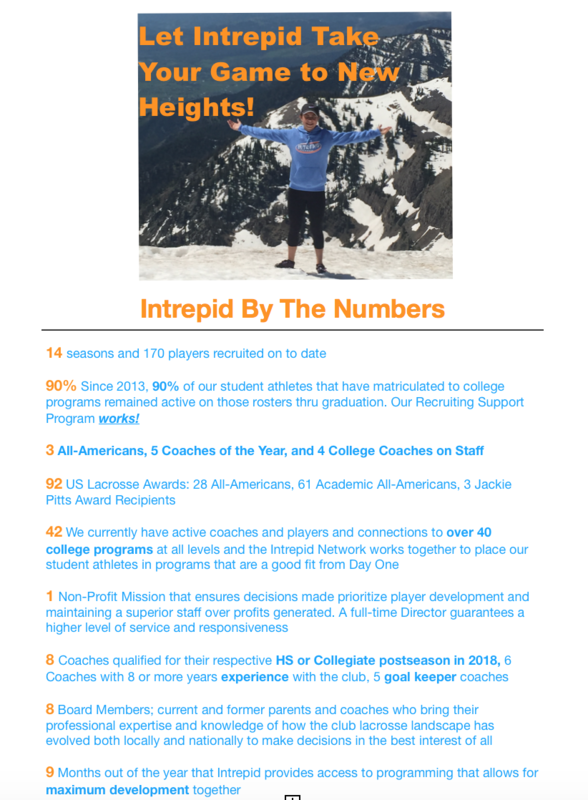 CURRENT INTREPID MEMBERS: CLICK HERE to access recruiting materials. 1. Focus on the player: No pressure to play at any specific level-the goal is to find a home for 4 years. We want the girls to emerge from college as strong, independent women who have earned a degree and we believe lacrosse can be a great part of that. Our college athletes have a 90% 4-year matriculation rate when utilizing this package. 2. Our Director gets to know coaches and programs to better assist players in making selections that will be good fits for them. 3. A process driven by a person rather than a computer means our Director is able to get to know each player and have honest and open communication about their college wishes. With 15 years of experience mentoring young adolescent females, our Director brings a compassionate and understanding approach to her recruiting discussions. Her former background in higher education also allows for assistance with financial aid, planning school visits, navigating the application process, and selecting the school that is best for each player.